Spare parts supply has allways been of prime importance within the Lohr group as even the best equipments need a perfect support. The heart of the system is our central store in Duppigheim from where we manage over 7000 references required by the various types of carriers on the road. We are still able to supply parts for vehicles over 20 years old. Our information and consumption analysing systems enable us to manage and anticipate the requirements in order to guarantee an optimised spare parts awailability. Also they can help for any product modification with the assistance of our engineering department. 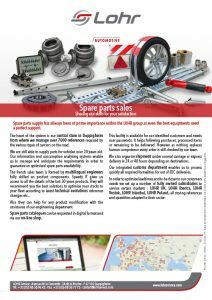 Spare parts catalogues can be requested in digital format and via our online shop. This facility is awailable for our identified customers and needs user passwords. It helps following purchases, processed items or remaining to be delivered. However as nothing replaces human competence every order is still checked by our team and the technicians remain at your disposal at all times. We also organise shipment under normal carriage or express delivery in 24 or 48 hours depending on destinations. Our integrated customs department enables us to process quickly all required formalities for out of EEC deliveries. In order to optimize leadtimes and to be closer to our customers needs we set up a number of fully owned subsidiaries to service certain markets : Lohr UK, Lohr Iberica, LKA, Lohr Istanbul, Lohr Polska, all storing references and quantities adapted to their sector.